The Sanitec collection ... by Geberit. Geberit, a European leader in sanitary products, has announced that the brands Keramag, Keramag Design, Twyford, Kolo and Geberit are now being handled as a single company as of last month. This will allow the company to offer all-round solutions for the bathroom from a single source. Geberit has combined the product portfolio and expertise in a single sales team that now represents all brands for its customers. “Regardless of whether customers are looking for sanitary systems, pipes, ceramic appliances or bathroom furniture, they now have one team for the entire portfolio,” says a company spokesman. 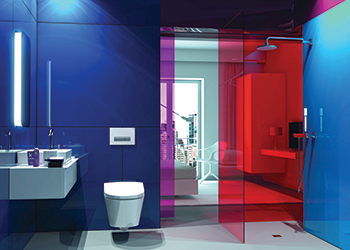 With its acquisition of Sanitec in February 2015, Geberit has become a full range sanitary supplier. It offers an elegant combination of sanitary products from Geberit and ceramic appliances and bathroom furniture from Sanitec. “Geberit and Sanitec are now operating joint business,” says Andre Winogradsky, managing director heading the Gulf region. To this end, Geberit has trained the sales staff on products and services of the respective brands. With its combined field service team and uniform sales system, Geberit is reducing the complexity when planning and building sanitary installations while at the same time ensuring greater reliability in terms of planning and implementation. The technical services team is also trained on both product portfolios and their technical specifications so that customers will only have to deal with one company in future. The globally operating Geberit operates as an integrated group with a very strong local presence in most European countries, providing unique added value when it comes to sanitary technology and bathroom ceramics. The production network encompasses 35 production facilities, of which six are located overseas. The group is headquartered in Rapperswil-Jona, Switzerland. With more than 12,000 employees in over 40 countries, Geberit generates net sales of $2.56 billion.